If you ever hear anyone say ‘plog’, then you know they have read this crime novel. 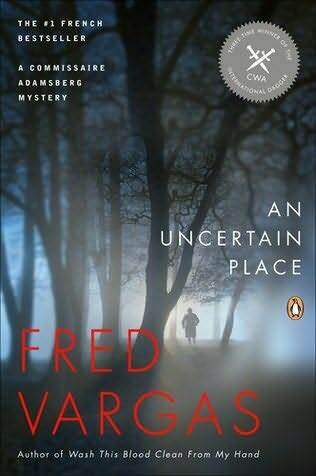 Totally different to any other crime novel I have read, this is my first Fred Vargas and will not be my last. It is the tale of fear, passed on from one generation to the next. Inevitably the tale is embroidered a little along the way, misinterpreted, but still half-believed. Believed enough to act on it, to prevent the fabled terror from continuing. The trail starts in London: shoes are found outside Highgate Cemetery, with the feel still inside them. Next, two gruesome murders. Many unrelated strands come together and finally the pieces fall into place in a tiny wooded village in Serbia. This is my first Commissaire Adamsberg book. I love discovering a new author, knowing there are many books just waiting to be read. Fred Vargas has created a quirky policeman – I particularly liked Adamsberg’s relationship with his one-armed Spanish neighbour Lucio. To read an interview in The Daily Telegraph with the intriguing Fred Vargas, click here.